New Dawn of the Planet of the Apes Poster Released! According to Hollywood, should we ever, by means of nuclear war, lack of resources, global warming or the release of a dead tissue resurrecting or inteligence granting pathogen, descend into a post apocalyptic existence, then we the human race are well and truly screwed. In none of these scenarios is their a silver lining for mankind, no pot of gold at the end of the struggling to survive against genocidal machines, mutants, nomadic gangs, the walking dead or a new dominant race of apes. Should a post-apocalyptic future ever become to pass we are destined to be either food or slaves, or both. The frightening truth behind all of these ever-increasingly-popular doomsday movies is that minus the over-exagerrated antagonists that feature, we are on a tightrope, a fine line of descending into such an existence, be it from nuclear, chemical or biological fallout, global warming or the exhaustion of our natural resources. And much like in the movies we so enjoy, should we ever cross that line and fall from grace, it will be because of our own ignorance and of our own making. 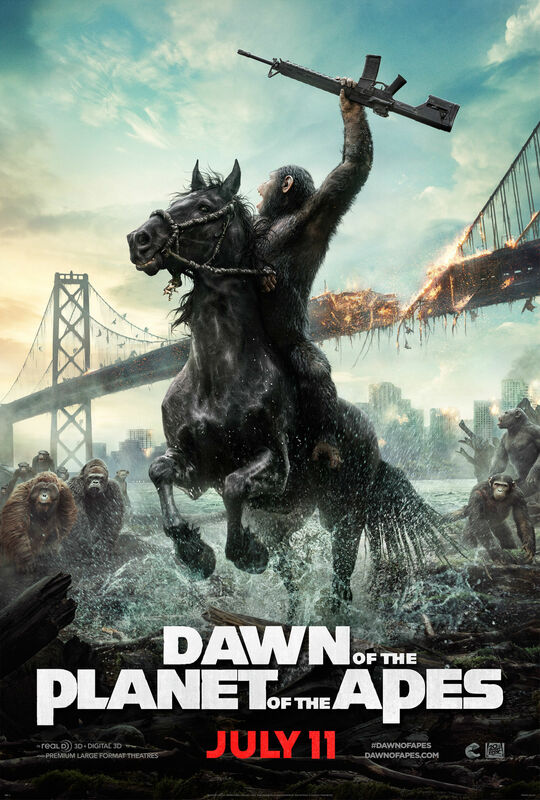 1 Fan responses to New Dawn of the Planet of the Apes Poster Released! I'll just take a rifle and shoot the damn apes. Beowulf will do, or just get Ingen to bring over D-rex.